Small businesses, large corporations, educational and government institutions – they all use fillable forms to gather information that is essential for providing various services. Paperwork is here to stay, but there are a lot of downsides to it such as printing and archiving costs, as well as time and effort spent on manually filling those non-interactive forms. Furthermore, many professionals rely heavily on data to make important decisions. Analyzing that data properly requires a specific set of skills, tools, and experience, but the first step in the process is collecting it. And on a large scale, forms are the most efficient way of obtaining data. So, how can these important processes be improved and simplified? The solution is to go for interactive, fillable PDF forms. Besides making offices as paperless as possible, all the steps needed in providing information, on one side, and collecting it, on the other, are done digitally. 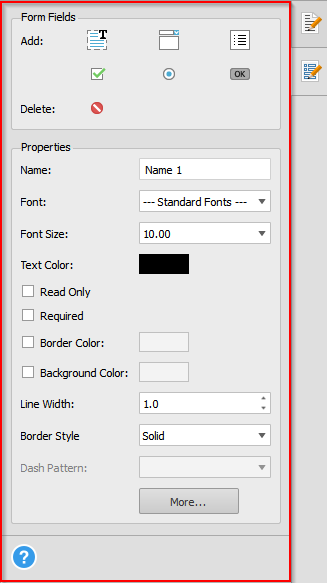 How to create fillable PDF forms? How to turn a non-interactive form into an interactive one? How to edit existing PDF forms in order to reuse them? But the most important dilemma is how hard is it exactly and how many tools do you need to get the job done? Believe it or not, creating, editing, and filling interactive PDF forms can be done quickly. As a matter of fact, dealing with PDF forms is one of the most prominent features introduced in the newest version of Able2Extract. Follow along as we explain how it’s done. The first step is to Open any PDF document or Create one from supported formats. Go into Edit mode by clicking on the appropriate icon in the Main Toolbar and click on the PDF Form Editor tab on the right-hand side. This variety of options is there to help make the process of collecting data intuitive and quick for both sides involved. Every form field option has its own Properties section which will give you complete control over customizing the form field. And the “More…” button gives you access to its Additional Properties. 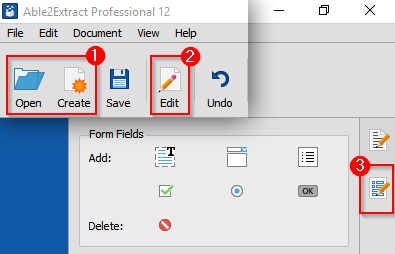 If you need an additional page, you can use another new feature of Able2Extract Pro 12 – Insert blank PDF page. It can be used in the Edit mode, under the Pages section by clicking on the “Insert…” button. In order to edit an interactive PDF form, open it in Able2Extract, go into Edit mode and click on the PDF Form Editor tab. You can then change the properties of the existing form fields, delete them, or add new ones, as explained above. Non-interactive forms can be turned into interactive ones by replacing ordinary lines and lists with their interactive counterparts. 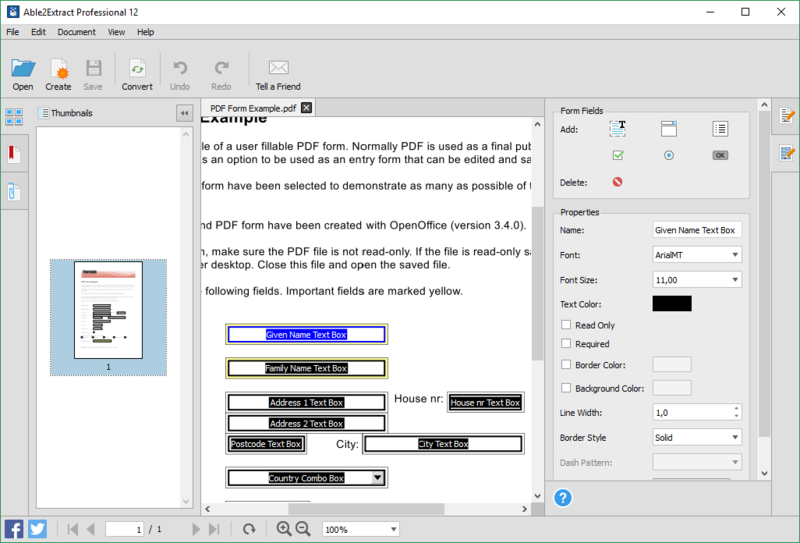 Able2Extract Professional 12 is also a PDF form filler. Once a form (which was previously saved locally to your computer) is opened, the software will automatically detect any interactive elements it contains. You can then start filling in boxes and interacting with buttons in the default Conversion mode. When you complete the form, you can either hit the submit button (if the form has one) and send the data to online servers or save the form to your computer by clicking the Save button in the Main Toolbar and send it via email or messaging services. Of course, if you want to learn about every functionality of Able2Extract Pro 12 when it comes to making fillable PDF forms, be sure to consult our comprehensive help file (which can also be accessed offline by clicking on the question mark below the Form Fields Properties). You no longer need to waste any more time and paper on non-interactive forms you need to fill and analyze manually. Instead, you can do both with one single tool. Bottom line? If you need to deal with PDF forms often either by creating, editing, or filling them, you can’t go wrong with Able2Extract. As an added bonus, you can boost your office productivity significantly by using this feature alongside all the others that our developers have improved in this newest version, such as creating, converting, editing, adding Bates numbering, annotating, securing PDFs, and much more. If you still have doubts, don’t worry. You can download Able2Extract now and try it for 7 days for free. For any other questions you might have, our support team is at your disposal. 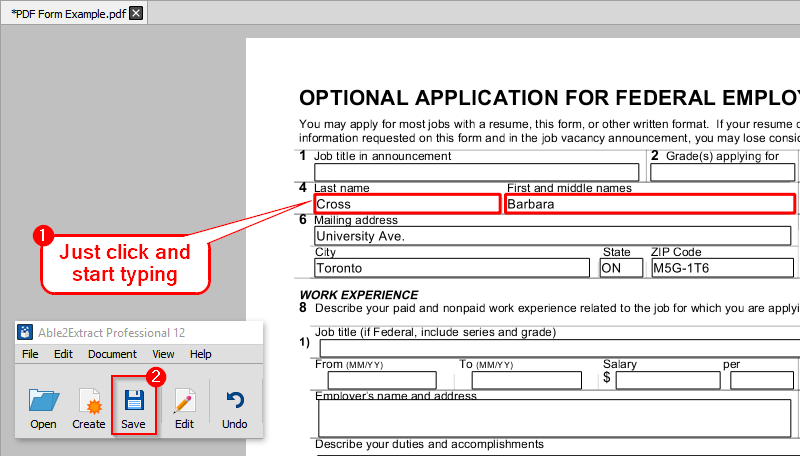 ​Introducing Able2Extract Pro 12: PDF Forms, Bates Numbering, More!